Happy St. Patrick's Day everybody! In order to celebrate this special day, I will be reviewing the debut solo album of my favourite Irish person, Róisín Murphy! As you might have figured out by now, I'm a big fan of her music - her 2007 album Overpowered got four and a half stars out of five in my review of it. Once I was actually on this huge party cruise and I met this Irish girl. Having previously had a drink or two, I went to her and asked if she knew what was the best thing to come from Ireland. "Um, Guinness...?" she suggested carefully. 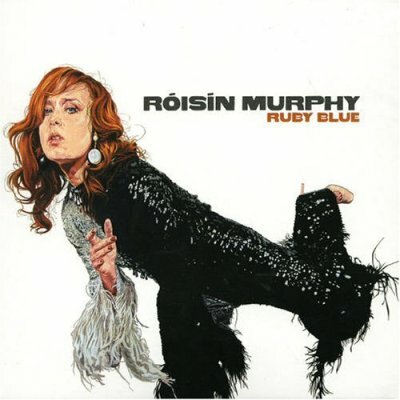 "Nope, that'd be Róisín Murphy. She's so freaking amazing", I said. She looked confused, uttered "Good for you", and left. Alright then. But seriously, if I were Irish, I'd consider her as nothing short of national treasure! So, the album. After Murphy and her then-boyfriend Mark Brydon ended their relationship and thus, their band Moloko (known for hit singles such as "Sing It Back" and "The Time Is Now"), Murphy went on to launch a solo career. The recording process of her debut album actually began whilst Murphy was still in Moloko. Collaborating with a previous Moloko remixer Matthew Herbert, Murphy recorded new material which was initially released as three vinyl-only EPs titled Sequins 1, Sequins 2 and - yes, you guessed it - Sequins 3. The three EPs were then compiled as a studio album which bears the name Ruby Blue, sharing its title with one of the album tracks. Ruby Blue features an intriguing soundscape, often sampling sounds created by everyday objects and actions such as alarm clocks and clicking noises. Mixing quirky synths with brass-tinged arrangements, the album is less electronic than Moloko's material, reinventing Murphy as a modernised version of a 1920s jazz diva. This experimental jazz-pop suits Murphy's versatile vocals surprisingly well, and although the LP didn't fare too well what it comes to its commercial performance, it's nonetheless an innovative and creative masterpiece. Sacrificing radio-friendliness for the sake of artistic expression was a bold move and certainly worth it. Kicking off the album comes "Leaving The City" which originally served as the closing song of the EP it first appeared on, and it introduces the listener to Murphy's new musical direction, with her being more eccentric than ever before. But as the infectiousness of "Sinking Feeling" demonstrates, outlandishness does not rule out catchiness - I can almost guarantee that you'll be snapping (or at least tapping) your fingers to the beat. "Night of the Dancing Flame" is a spectacular modern jazz number that underlines the 1920s influences the album has. Its lyrics paint pictures of tribal dances around a fire, like an ancient pagan mating ritual taking place somewhere surrounded by untamed nature. The ballad "Through Time" is one of the most easily accessible tunes here, with its retrospective lyrics presumably describing Murphy's past relationship with Brydon, with Murphy wondering "Could there be such a thing? / Beautifully flawed ideals of love". The instant grower that is "Sow Into You" was released as the second single from the album, and sounds like a disco pop tune remade with jazzy arrangements. The song compares falling in love with the forces of nature, with Murphy also confessing to her new lover: "I chose you for your wave frequency / You take me up against the freak in me". The music video keeps up with the quirkiness of the song, portraying Murphy as a futuristic mechanical human/insect hybrid. "Dear Diary" is one of the tracks that most play with unconventional everyday-objects-as-musical-instruments samples, whilst simultaneously telling the story of a girl who's afraid to confess her love: "No I, I won't send this Valentine (Oh my) / Violets are blue (I won't send it) / And if you don't receive this Valentine (I won't pretend it) / Doesn't mean it ain't true / And I'm not thinking of you". To tie this review more into today's Irish theme, back in Finland I used to go to the local Irish pub quite often and they'd occasionally play this song in there. I shall have to find a new Irish place to go to today (you know, to get a Guinness. Or two.) and find out if they'll do the same there. And while the album is pretty unconventional in itself, no track is quite as bizarre as the tribal oddity that is "Ramalama (Bang Bang)" (whose song title might be a reference to the 1957 song "Rama Lama Ding Dong" by The Edsels. Or not.) It's lyrics are extremely cryptic, but they could refer to how she writes music with the principle of staying true to herself (rather than opting for a more commercial route): "Unzip my body, take my heart out / 'Cause I need a beat to give this tune". The chorus, consisting mostly of onomatopoetic words, could describe the sound samples they recorded for the album: "Ramalama bang bang / Flash bang big bang / Bing bong, ding dong / Dom dom do dom". So the song could possibly be a kind of a meta-commentary on the recording process of the album. Or not. Some things might be better left unanalysed - just embrace the weirdness! "Ramalama (Bang Bang)", the edgy title track "Ruby Blue" - which is another album highlight with its distorted guitars and super quirky arrangements - and the aforementioned "Night of the Dancing Flame" have also been used on So You Think You Can Dance in choreographies by Wade Robson. "Off On It", like the two tracks before it, showcases Murphy and Herbert (and the album itself) at their most experimental, and while "Love In The Making" was the only song from the Sequins EPs to be excluded from the compiled studio album (though it was later used as a B-side for the single release of "Sow Into You"), a 52-second excerpt of its intro makes an appearance as "Prelude To Love In The Making" which leads to the closing song, the gorgeous piano-led ballad "The Closing of the Doors". This captivating number sees Murphy crooning as a cabaret singer, ultimately finishing the song and the album with beautiful humming. The avant-garde jazziness of Ruby Blue brings to mind another quite similar album, The Creatures' Boomerang from 1989, so if you like one, make sure to check out the other one as well. During their career - spanning a decade and four studio albums - Moloko created a very distinctive musical style, but with this record, Róisín Murphy reinvented herself successfully as a solo artist of her own. And what an album it is: it's artistically ambitious but playful, experimental but easily enjoyable. Ruby Blue is a brilliant LP full of ingenious jazz-pop with a Róisín twist. Try at least: "Sow Into You", "Ruby Blue", "Night of the Dancing Flame", "Ramalama (Bang Bang)"